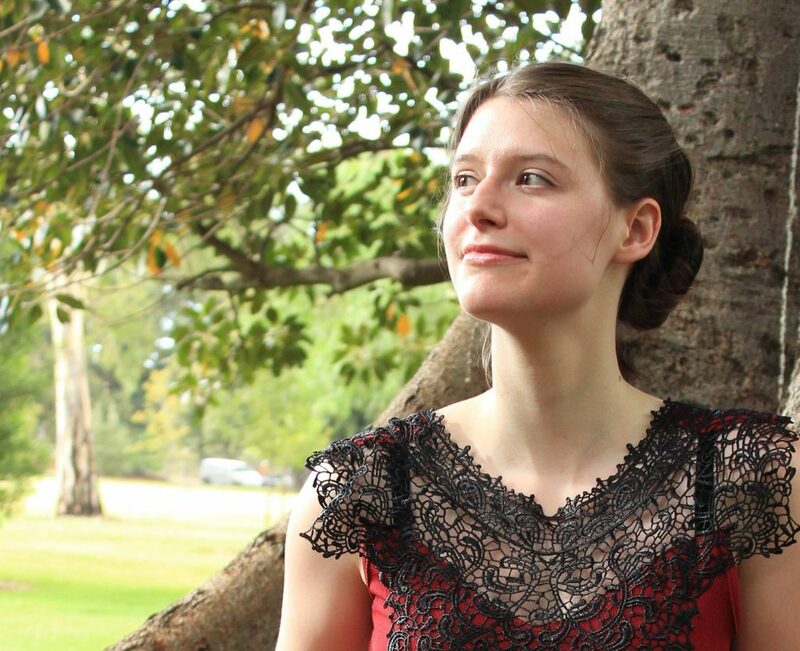 This is the first in an anticipated series of profiles from a selection of ATKM writers, and we are thrilled that Miranda Richardson, writer of the ATKM comic Sinking Ship, has volunteered to be our guinea pig. Thanks, Miranda! I’m a South Australian writer/artist currently working on Hail (http://hailcomic.com), a superhero comic about a woman who crumbles into shards of glass when she experiences anxiety. I have a big interest in illness narrative in fantasy and a growing interest in romance comics. When I’m not making art, I work part-time doing administrative things at a hospital. In my spare time I do Irish dancing, pole dancing, and drink too many cups of tea. I’ve been writing since I was very young, but I did a creative writing degree for six years at Flinders University so you could say my writing career began somewhere in there. I started out publishing articles and short stories and only got into comics about two years ago. But it was a very intensive two years! I’d say my favourite comic writer is Natsuki Takaya, whose most famous work is Fruits Basket. Her gorgeous, expressive art style, the way her panels unfurl on the page, and sheer emotional intensity gets me every time. I also love Kazu Kibuishi, Hiromu Arakawa, Noelle Stevenson, Yoshitoki Oima, Tracy J Butler, Kelly Sue Deconnick, Patrick Ness. Oh man, and I recently started reading Naomi Novik. So good. Jo Spurrier. The list will never end. Well, I passionately hate editing my own work, so in order to minimise that I tend to form everything more or less in my head before I write it down. And I plan pretty meticulously, narrowing things down further and further until I hit dialogue and panel ‘beats’ in time. Then, if I’m working with an artist, I type it up in script form so that another human being can understand it. That’s what I do with comics, but I’m not too different with prose either. Maybe it’s because I’m a fantasy/scifi writer, when one plot hole can force you to rewrite the whole thing, but I’m big on the planning. Sinking Ship is a story that features a hospital that is slowly being stripped of its staff and resources by the government, and eventually is decommissioned entirely. Where did this story’s concept come from? Ahaha, well, this is awkward… I started working recently at a hospital that is being senselessly shut down by our government about six months ago. By no means is Sinking Ship a mirror of that and none of the characters in it represent real people, but I was definitely prompted to write it by personal experiences. Working in a place with that kind of powerlessness, uncertainty and imminent loss hanging in the background makes for some really complex conflict and camaraderie. It’s not just about a health care facility being shut down though; there are work places and vital institutions being strangled by the government everywhere in Australia right now. So I think it’s a situation a lot of people would understand. Some people might recognise your name from the online comic Hail. I’ve read this comic – I think it’s great. The metaphors in play here are delicious beyond words, and the glass imagery in the comic is very intricate and gorgeously rendered. How did Hail come together for you, from concept to execution? At the time I was doing a lot of study not only on gender roles in comics, but also on metaphor in illness narrative. Lots of scholarly people believe that portraying illness as metaphor is unethical, mainly because the metaphor can never be complete and it inevitably reaches a point where it’s no longer a true representative of the condition. But really, fiction is never going to perfectly mirror reality. And metaphor is so powerful, and the language to describe illness is so limited, that I think it’s worth trying to use it to say something important. In the end I decided to just be true to my experiences and hope that there would always be parts of it that others could relate to. So I started working on Hail as a serial comic while I was in uni, and after I graduated I was incredibly lucky to be allowed to continue working with other Flinders Uni art students. I met Rosanna through uni as well as most of the other people on the team. From there we just kicked into gear and went for it. In a way we’ve all been teaching each other as we go along, and I’ve loved seeing how the comic has developed since we began. What’s been the response to Hail so far? Like most writers, I’m always hungry for feedback, but we have had a few people say in conversation or message us now with really encouraging comments. My biggest fear is that someone will tell me that I’ve made some huge mistake in representing anxiety or mental illness and I’m a terrible person. Because I’ve put so much thought into what I’m saying and I’m trying to be really careful and gentle with these important themes. But so far people have said that they’ve related to different aspects of the story, and that’s exactly what I hoped for. I’m definitely still open to feedback as I continue to develop the narrative. As for the art, people have praised Rosanna’s glass work a lot and I usually end up marvelling about how long it must have taken her along with them. They’ll be like, ‘This looks amazing,’ and I’ll be like, ‘DOESN’T IT??? Look at that bit! There’s so much detail!’ Which must sound really weird since I’m technically one of the creators. I’m just always impressed by the people I’m working with. It’s not just Rosanna, everyone on the team is just so exceptional. I’m so lucky to be working with them. What do you enjoy most about writing Hail? Oh wow, all of it? I love collaborating with the team, seeing the pages come to life as they go through every art stage influenced by each artist’s interpretation. I love the supportive comics community I’ve walked into, and of course I love the writing itself. Through the actual writing process though, I’ve been surprised by how much Lena’s experiences have helped me process my own issues. It’s like I’ve fabricated a person who completely understands and accepts my weaknesses. It’s like, because I can forgive her, I can forgive myself. Isn’t that weird? Writers are so weird. What’s been the hardest part of writing Hail? Hmmm, probably just the marathon-like nature of the project. By the time the first volume is complete, we’ll have been working on Hail for two years straight. It’s pretty intensive, getting 8 pages done per month alongside our other responsibilities. I’m basically at work 24/7 as I answer messages, do publicity stuff, as well as the writing, lettering and occasional inking/colouring. It’s all things I enjoy – but long-term projects definitely have unique challenges and you have to manage your personal resources well. Fans of the Hail Facebook page will know that a print version of the comic has been in the pipeline for a while. You’ve launched a Kickstarter campaign [ed: now finished] to fund a print run (and I’m a proud backer). Tell us about that. Why, thank you for asking! We’re hoping to print the first three issues (sixty pages total) of Hail for a launch on June 25th. We quickly got over our minimum funding goal so we’re able to print the first issue! But we’d like so much to print issues 2-3 as well and get a good strong start in print that will hopefully carry us through to publish later issues.. If anyone has a look at Hail and likes what they see, please consider supporting us. You might think $10 isn’t enough money to make a print run happen, but it adds up fast. All three issues are on our website to read for free if you wanna check ’em out. 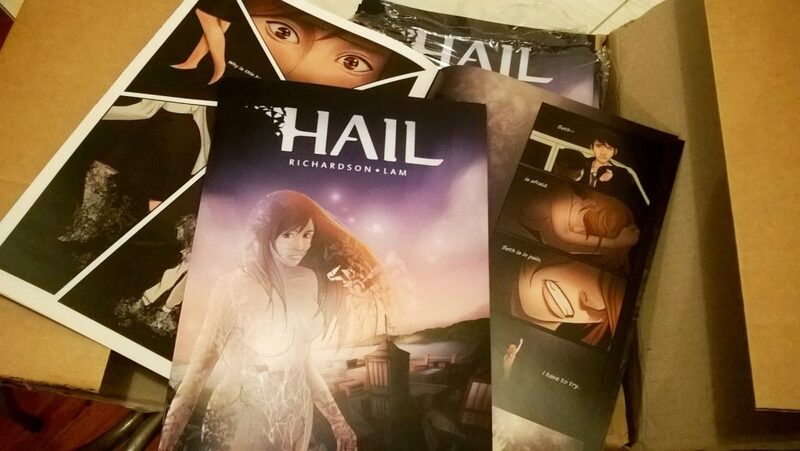 Hail’s getting its first print run very soon! All the King’s Men is kind of the only thing I’ve managed to make time for outside Hail this year – but the ideas have definitely kept coming even though I didn’t have time to do anything about them. I really want to write a sports/romance crossover comic about a synchronised swimmer who can turn invisible for as long as she can hold her breath. There’s also a novel I’ve had in the works for years called Shederow, which is about spirits and trauma and… kind of about trying to appreciate others’ feelings and choices even if you don’t understand them. I don’t really have a one sentence description of that one yet, haha. Where would you like to see your writing career in five or ten years’ time? I’d like to get paid for a bit more of my art work one day, but there’s no way to tell if or when that might be. When I started an arts career I made sure I could accept the possibility of maybe working part time in something else forever, living a double life and not having much money. I think it’ll be tiring at times, but it’s the only life for me. As for what I’d be doing in my writing career… I’d love to keep working on films, animations, comics and novels as much as I can please! We here at ATKM HQ think Miranda is a writer worth following.